You could be singing with Ronan Keating! 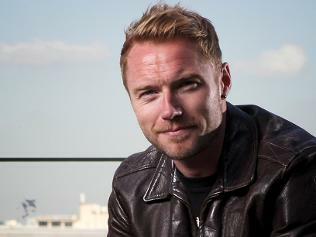 Ronan Keating is gearing up to release his new album 'Duet' on November 12. The album features Guy Sebastian, Brian McFadden, and many more pop icons.... but for Ronan's next duet, The Kyle & Jackie O Show want you! Simply tell us why you think you have what it takes to sing with Ronan, and you could be recording your very own duet with him! Register your details now for the chance to win. rish singer/songwriter Ronan Keating has always held a special fondness for this part of the world - through his success as a member of Boyzone and as a solo artist, to calling Down Under home as a judge on the current series of The X Factor Australia. Following his recent visit to New Zealand to present a couple of Tuis at the NZ Music Awards, Ronan will release a special Australian/New Zealand only album titled Duet on November 15. The 12 track album will feature songs with fellow X Factor judge Guy Sebastian, countryman Brian McFadden, New Zealand's own Adeaze and Hayley Westenra, Australian Idol's Paulini, The McClymonts, Lee Kernaghan, new Island Records signing Marvin Priest along with international artists Cat Stevens, Lulu, LeAnn Rimes and Elton John. 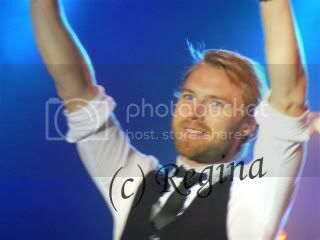 Ronan said, "I have an amazing relationship with Australia and New Zealand. You have welcomed me with open arms and made me feel like one of your own and for that I thank you. So... I thought I would put an album together especially for you! On this record I have had the chance to work with some of your best and it has been an inspiration". Irish singer songwriter Ronan Keating is releasing an album featuring collaborations with a host of Kiwi and Australian artists. The album, titled Duet, features 12 tracks with songs featuring our own Adeaze and Hayley Westenra and Australians Brian McFadden and Idol winner Guy Sebastian. Other songs feature Australian Idol's Paulini, The McClymonts, Lee Kernaghan along with international artists Cat Stevens, Lulu, LeAnn Rimes and Elton John. Keating said he had amazing relationship with Australia and New Zealand and that the album was produced just for his fans down under. "You have welcomed me with open arms and made me feel like one of your own and for that I thank you. So... I thought I would put an album together especially for you! On this record I have had the chance to work with some of your best and it has been an inspiration". Keating found fame in boy band Boyzone and as a solo artist in the 1990's and has more recently been calling Australia home as a judge on The X Factor Australia. Duet will be released in New Zealand on November 15. Preorder on Chaos with free international shipping! 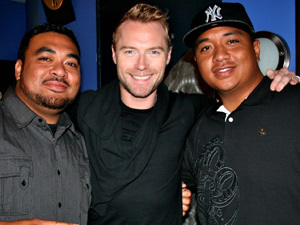 Ronan Keating rates new his buddy and one-time Australian Idol winner Guy Sebastian as among the best singers he has ever worked with. The X-Factor pair have recorded a duet together, a cover of All For One which was originally performed by Bryan Adams, Sting and Rod Stewart for the 1993 film The Three Musketeers. The song features on Keating's new album Duets alongside previous collaborations with music legends like Elton John and Cat Stevens. "Guy's become a good friend of mine and we spend a lot of time together so it was brilliant working with him and he's probably one of the best singers I've ever recorded with," Keating told AAP in Sydney. "What a great voice and what a great ear for music, he's got a real understanding of melody and we nailed that song in 20 minutes. "All For One was the quickest song to record and it's my favourite on the album." The Boyzone star decided to record his Duets album in Sydney partly as a way to kill time when not busy on X-Factor duty. A variety of Australian artists, including country stars The McClymonts and Lee Kernaghan, were invited into the studio to record cover versions of some of his favourite tracks. "I've written a lot of songs that have crossed over between country and pop and in my heart and soul there's a part of me that loves country music," Keating said. "I'm a big fan of country artists like Colin Raye, Garth Brooks and Reba McEntire, it's beautiful stuff." Duets is only being sold in Australia and New Zealand but Keating is planning a worldwide album release next year which will see him collaborate with a musical great, albeit one he can't reveal right now. "He's American, an old school singer songwriter who was part of a famous duo whose songs are incredible," he said. Duets is released on November 12. Keating is planning a worldwide album release next year which will see him collaborate with a musical great, albeit one he can't reveal right now. I don't even care who it is - Just make it happen!!! Wow! The album is already on the charts, a great start! RONAN Keating has enlisted his new Aussie friends to help recorded a new album called 'Duet'. The 33-year-old, who is in Sydney with his family to be an X Factor judge, has recored a series of duets with Guy Sebastian, Paulini, The McClymonts and Lee Kernaghan. Plus he's included some of his best known collaborations, including Father & Son with Cat Stevens and Your Song with Elton John. The album is released on November 12.